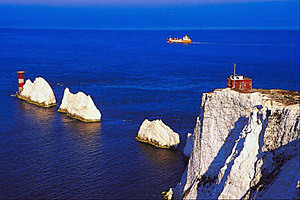 Located just of the Hampshire coast (separated by the Solent) the island is 23 miles (37 km) wide and 13 miles (21 km) long. The island is well known for its soft sandy beaches, peaceful scenic locations and majestic cliffs. It has been a popular holiday destination since the Victorian times. Queen Victoria was a regular visitor during here reign, and her island dwelling "Osborne House" is open to the public. The landscape is chalk cliffs, bluffs and downs, with deep ravines leading to the coast; known locally as 'chines'. Inland it is a place of attractive countryside and quaint villages with thatched cottages and colourful gardens. Ferries regularly travel to and from the island from Southampton, Portsmouth, and Lymington. Tourism is the island's mainstay, and it is a very popular destination during the summer months. Cowes, on the north coast is a great sailing centre, where the Royal Yacht Squadron has its headquarters. A number of national and international yachting events are staged at Cowes each year. The Isle of Wight was designated an administrative county in 1890 and again in 1974. However, it is still considered a part of the geographical county of Hampshire. Isle of Wight Doughnuts - one of the best known traditional yeast cakes in Britain. The Isle of Wight means the island risen or heaved out of the sea. The island was called Vectis by the Romans, who conquered it in AD 43. Vectis means a 'separate division'. Roman villas have been discovered at Newport and Brading. The island became popular during the Victorian era, when tourists came in droves to enjoy its long sandy beaches, warm climate and quaint little fishing hamlets.